I love homemade (vegetarian) Burger. And when really everything – from burger patty to the bun – is made by myself, it did not longer deserve the term “fast food”. 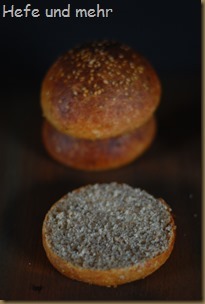 To push this dish to the healthy side, I bake the buns this time with 50% whole grain flour. 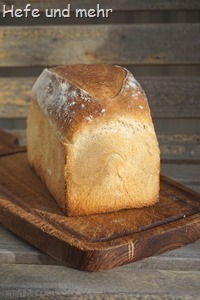 The whole grain flour is a mixture of self milled spelt, wheat and buckwheat. 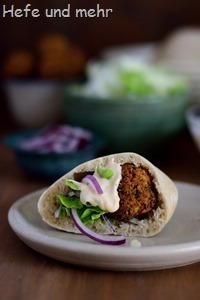 This is not only healthy but it adds a deep nutty flavour to the buns as well. 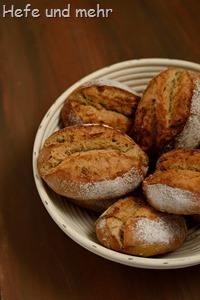 The only problem when baking with whole grain flour is that they tend to get dense and dry. To prevent this I made a hot soaker with some of whole grain flour and used the rest for autolysis so the bran could absorb as much water as possible.Adding some sourdough starter from the fridge as well as some malt helps to create round flavour. 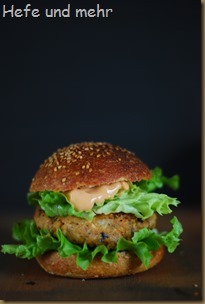 The buns were great, with a soft and tender crumb, and together with some lentil cauliflower patties and a lot of lettuce and tomatoes they were a delicious dinner. And the leftover buns tasted good as breakfast roll with some honey or marmalade, too! Mill the grains for the flour mix. If you do not have a mill, use store bought whole grain flour (spelt, wheat, buckwheat) in the same proportion! For the soaker stir the flour mix in the boiling water. Let it sit for 1 hour, until it reaches room temperature. For the autolysis dough mix the flour mix with water until homogenous. Let it sit for 1 hour. Knead all ingredients for the dough for 5 min at slowest speed, then around 10 min on fast speed until complete gluten development. Divide into 80g pieces and form to round buns. Wet their surface and sprinkle with sesame. Cover and proof for 1.5 hour. In the meantime heat the baking stone to 250°C. Bake at 250°C for 20 min with steam. 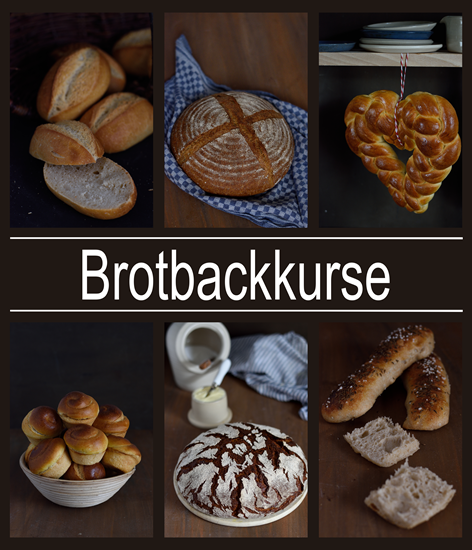 @Ellen: Du hast zwei Möglichkeiten: entweder du bäckst die Brötchen heute 3/4 fertig und backst sie morgen auf. Das geht gut und durch das Brühstück halten sie auch lange frisch. Alternativ reduzierst du die Hefemenge auf 6g und lässt den Teig tagsüber für ca. 10 Stunden im Kühlschrank gehen. 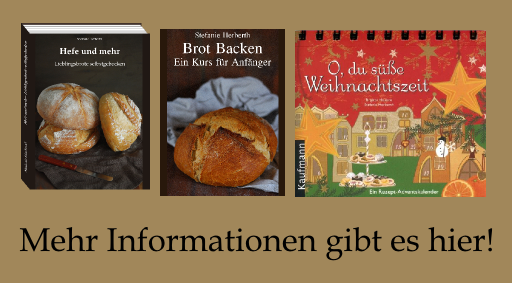 Dann die Brötchen formen und zur Vollgare gehen lassen. was die Hefe betrifft, nimmst Du Trockenhefe? Wenn nicht, kann ich die Hefe mit Trockenhefe ersetzen und mit welcher Menge? @Maru: Ich verwende immer frische Hefe. Trockenhefe kannst du aber natürlich auch nehmen, dann teile die Hefemenge einfach durch 3. Wenn ich bisher Burger gemacht habe, habe ich Vollkornbrötchen gekauft. 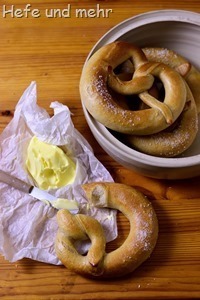 Wenn ich Zeit habe, versuch ich dein Rezept mal. Oh, die klingen spannend. Verwendest du flüssiges Malz? Wieviel (inaktives) Trockenmalz würdest du ersatzweise nehmen? @Eva: Ja, mein Malz ist flüssig. Da der Zuckergehalt mit 80% angegeben ist, würde ich 16g Trockenmalz nehmen.